The amazing talent of the soon to be graduating Art and Design majors was on display Monday night in the Earle N. Wright Community Room during the Sophomore Art Showcase Reception. Graphic design students displayed the portfolios they did for portfolio class. The portfolios showed the full range of work done by the students throughout their time at Cowley. 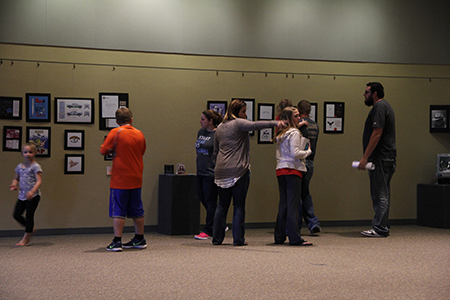 The art students displayed five pieces of work serving as a representation of their capabilities. Sophomore graphic design students at the showcase were, Sam Crowl, Alex Dominguez, Danielle Edwards, Sarah Jellings, Gigi Marquez, and Whitney McCully. Sophomore art students were, Allyson Chrisman, Sheldon Draper, Brianna Hand, Jason Johnston, Mamie Manly, and Ryan Rethemeier.